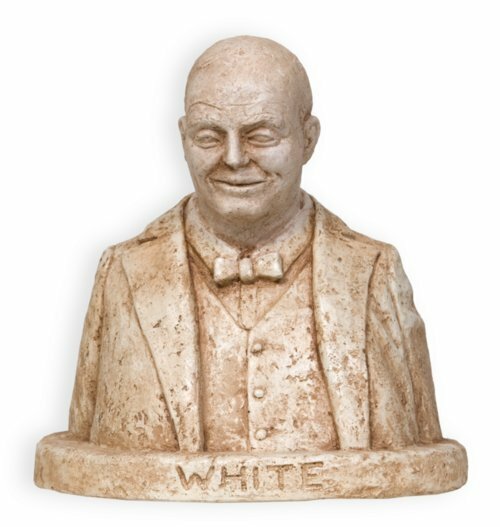 Small plaster bust of newspaper editor William Allen White by Kansas artist Peter "Fritz" Felten, Jr. The model is associated with the 1981 installation of statues in the Kansas statehouse rotunda. A special committee selected Felten from Hays, Kansas, as the sculptor of statues depicting four notable Kansans--Arthur Capper, Amelia Earhart, Dwight Eisenhower, and White. Felten created this small model and three others to demonstrate his design concept. Residing primarily in Emporia, Kansas, William Allen White was a nationally recognized newspaper editor, politician, and author. In 1923, he won a Pulitzer Prize for editorial writing. According to Felton, White's face proved difficult to sculpt because he was "a highly animated man."